On June 1, 2018 we began taking over sales and support for the Phoenix hoop, formerly made by SpinFX. While the SpinFX Phoenix and the Hyperion work similarly in many ways on the surface, their software and processors are very different internally. Rather than continuing to develop for both, we're switching the new Hyperion Phoenix model to a variation of the 3rd generation Hyperion controller board. This will give it considerably more processing power for advanced features, and several times more space for patterns. We'll be merging some of the Phoenix-specific features, like the Phoenix script system, into the Hyperion software. We'll continue to repair existing Phoenix boards as long as parts are available. By late 2018 we expect to be able to offer upgrade service for existing Phoenix hoops. The upgrade will likely require re-tubing the hoop. 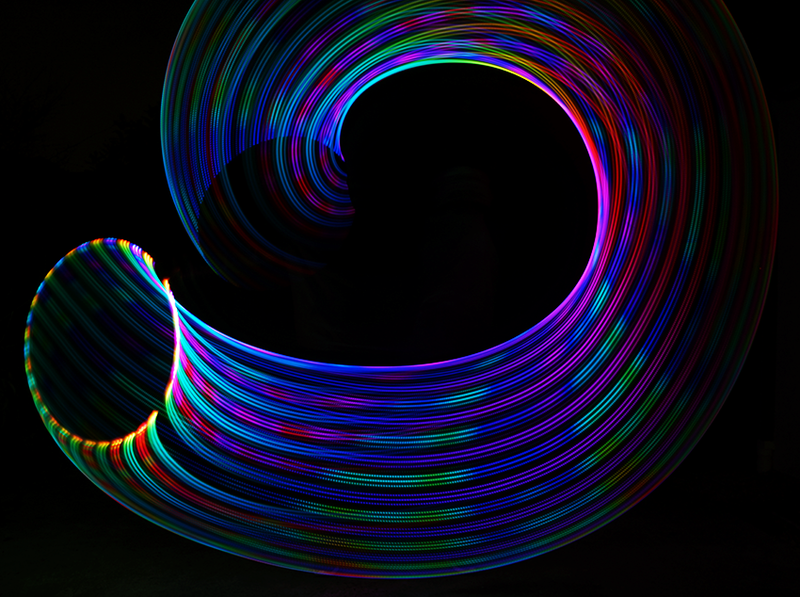 We'll be releasing some software updates for existing Phoenix hoops to allow them to work with Hyperion remote controls and to read more Hyperion pattern files. Aside from the controller electronics, you'll see some other changes in the Phoenix. For the moment we're offering the Phoenix in the same sizes offered by SpinFX, until we've had time to get all of the wrinkles ironed out of the new build process and set up new tooling. Eventually we hope to offer it in the same size range as the original Hyperion. All sizes are now the same price. Re-tubing service has been lowered in price to make it the same for both models, and we're offering new tubing options including aqua and violet polypro and white HDPE.